With a movie like Confirmation, you need a solid script to hold audience attention and HBO got one with writer Susannah Grant (Erin Brockovich). In 1991, the Clarence Thomas Confirmation Hearings and its ensuing drama captivated the country. For those who missed it, Judge Thomas was days away from being confirmed to the Supreme Court when Law Professor Anita Hill accused him of sexual harassment. A failed attempt to keep her testimony quiet led to a media frenzy that landed her in the spotlight. 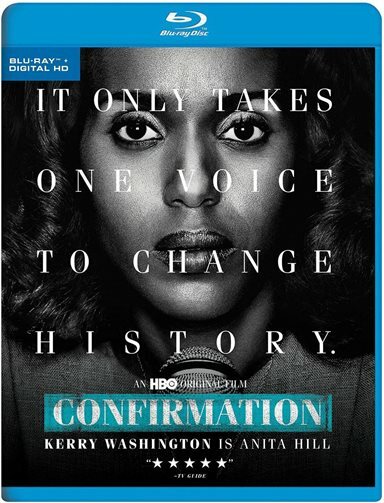 HBO Home Entertainment has once again shined a light on this time in our government's past with the television film, Confirmation, out this week on Blu-ray and DVD. Anita Hill (Kerry Washington; Scandal) was a lowly assistant in the early 1980's who worked under Clarence Thomas (Wendell Pierce; Horrible Bosses) at both the Department of Education and the EEOC. During an investigation before his confirmation, the FBI spoke with Professor Hill who claimed he often asked her out and made inappropriate comments to her of a sexual nature. When she was asked to testify before the committee, Ms. Hill was reluctant but felt what she had to say needed to be heard before Thomas was considered to ever be the next Supreme Court Justice. Over several days in 1991, both Thomas and Hill testified. She claiming he harassed her when she worked for him, and he categorically denying any and all allegations of misconduct. The Senators involved in the hearing seemed to do whatever it took to try and discredit Hill and stop other witnesses from testifying on her behalf. In the end, the hearing was shut down and Thomas was confirmed and sworn in as a member of the Supreme Court. However, what lingered was a "bitter taste" in many of the mouths of people around the country. These proceedings sparked a discussion of sexual harassment in the workplace and prompted record numbers of women to run for, and win, federal offices in both the House of Representatives and the Senate in the mid to late 1990's. And while she didn't get the outcome she wanted, Anita Hill will always be synonymous with opening a long overdue discussion (and laws) about harassment in the workplace. With a movie like this, you need a solid script to hold audience attention and HBO got one with writer Susannah Grant (Erin Brockovich). Her dialogue is thought provoking and insightful, as well as emotional. Her interpretation of the government's treatment of Professor Hill is hard edge and anger inducing. Her scenes flow seamlessly and, along with Director Rick Famuyiwa (Dope), they manage to keep the audience captivated. Washington can seemingly do no wrong these days, and Confirmation is no exception. She plays Hill with a toughness we tend to see from her character on Scandal, while emoting a layer of vulnerability and insecurity that seems to plague many women who come forward to accuse someone of harassment. Pierce is stoic, yet engaging, as he defends his name as Thomas. With a supporting cast including Greg Kinnear (The Kennedys) and Jeffrey Wright (Casino Royale), Confirmation has no lack of terrific performances. The Blu-ray is presented in 1080p High Definition video with a 1.78:1 aspect ratio making ideal to watch on one's television at home. The use of grainier filming techniques helps the overall feel of the films early 90's setting. The DST-HD 5.1 audio is perfectly fine and the dialogue and soundtrack mix is a smooth blend that allows the viewer to hear what is being said while setting the tone of the film. There are three extras on the Blu-ray that don't offer all that much in the way of content. The first two are pretty much trailers for the film starring Washington and Pierce. The last one is an overview of the characters and the actors who portrayed these real people. While the latter is interesting enough, it doesn't give all that much insight and a short discussion on the impact of this historic event on US history would have been a welcomed addition to the disc. Well written and beautifully acted, Confirmation could have been a preachy look at two individuals' struggles in what they each felt was a lynching by the US government and it's people. However, to Famuyiwa and Grant's credit, it is nothing of the sort. It is a well thought out and interesting look at to what lengths our Congress will go to get what they want. Download Confirmation from the iTunes Store in Digial HD. For more information about Confirmation visit the FlickDirect Movie Database.